Noahpinion: Are we replacing robots with Chinese people? Are we replacing robots with Chinese people? OK, REALLY, dissertation committee, this is my last blog post for a while. PROMISE. One problem may be offshoring by American companies, as stressed in a study by Michael Mandel, chief economic strategist of the Progressive Policy Institute, and Susan Houseman, senior economist with the W. E. Upjohn Institute for Employment Research. 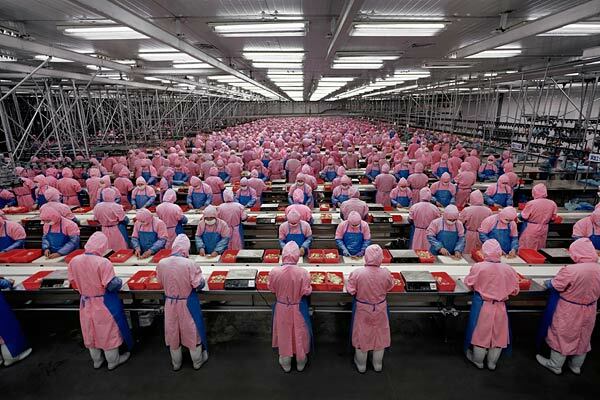 Some productivity gains from the manufacturing of the iPad are captured by workers in China, who make important parts of the device, rather than by American workers. American companies often save on costs by finding lower wages abroad, not by enhancing the abilities of American workers. That would help explain why measured productivity has often been high over the last decade while despite year-to-year variation domestic wages and job creation have been flat. I've been critical in the past of Mike Mandel's thesis. After all, productivity gains from outsourcing are real. Suppose I am a guy who designs and builds widgets. Hiring cheap Chinese workers to make my widgets more cheaply boosts my productivity almost the same, in the short term, as inventing a robot to make my widgets more cheaply (minus the small amount I pay the Chinese workers). BUT...productivity is not the same thing as technology. This is a fact that often gets ignored, since economists tend to treat the two as being equivalent. But they are not. In particular, trade can boost productivity without any new technology being invented. This is what Mandel claims has been responsible for the large productivity gains in the U.S. over the past 10 years. I tend to believe him. So why should we care whether our productivity comes from robots (technology) or from cheap Chinese labor (trade)? One answer - and I feel like this is what Cowen and Mandel may have been getting at - is that one may crowd out the other. And this brings me to the theory of endogenous growth. Paul Romer (a physics undergrad like me!) invented the theory of endogenous growth back in the 80s. The idea is that technological progress does not simply arrive out of nowhere, but is a byproduct of economic activity. Since ideas are a nonrival production input (a.k.a. a "public good"), there is no guarantee that the market will produce enough of them. Some growth models may be a lot better at innovation than others, and policy can make a big difference. If we're not channeling enough of our economic output into the production of new technology, we'll all be poorer down the line. I also assumed that an increase in the total supply of labor causes negative spillover effects because it reduces the incentives for firms to discover and implement labor-saving innovations that also have positive spillover effects on production throughout the economy. In other words, if we suddenly get access to a bunch of cheap Chinese labor, we don't bother to invent robots. Then tomorrow, when the cheap Chinese labor runs out, we find ourselves without any robots. This is just an assumption, of course. Even if the model works well, the assumption may be wrong. But it's an interesting idea, isn't it? What's even more interesting is that this exact same idea is one of the leading explanations for the "Great Divergence" between Europe and China that began around the 1600s. The idea is that European countries, flush with capital but short of labor, invented modern industrial technologies to compensate for their labor scarcity, while China, with a huge labor surplus, felt no need to invest in fancy machines. For more technical formulations of this notion, see Basu & Weil (1998), and this recent survey by Allen. But the basic idea is pretty clear: cheap humans crowd out robots. So here's the question: what if our slow rate of innovation is due not to an inexplicable slowdown in the arrival of new ideas, but from the fact that China has made the discovery of those ideas less urgent? If that were true (and I'm only raising the possibility), what would be our best response? Would shutting ourselves off from cheap Chinese labor force us to become like 1600s Netherlands and invent a bunch of cool robots? Or would it just cause companies to pack up and leave the U.S. entirely, rendering us a protectionist backwater? If there is a "negative labor spillover" going on, is our only choice simply to wait until it runs out? And is it already running out? I can't claim to have the answers. But I feel like Mike Mandel and Tyler Cowen (and Paul Romer and Basu & Weil) are on to something here. This has also been suggested as an explanation for slow technological progress in the slave-holding ancient Roman society. It's not just that you don't develop robot technology, to stay with your example. Having outsourced production you also are no longer in a position to spot and develop innovative methods, because the (necessarily senior) people you have with production experience are aging and there is no way for younger people to gain the same kind of hands-on experience with up-to-date production tech. I.e., you will not just not have the robots, you won't even be in a position to see what you would use them for, and so you won't miss them. It seems intuitively obvious that if one input to the production process is relatively cheap, the process will adapt to use more of the cheap input in place of expensive inputs. If anyone is interested in a more up-to-date example than ancient Rome, the New Zealand government adopted a low-wage policy around 1990. NZ's labour force participation rate then increased above (previously similar) Australia's, and its gross capital formation declined. Another point - Solow growth theory holds that returns to the factors of production match their contributions, in the long run. If wages are driven down (as a share of GDP), productivity will eventually decline to match. A final point: Cowen builds his case off two quarters of productivity decline. This may be due to labour hoarding in a de facto recession. Dan: Have you read this yet? "Why Amazon Can't Make A Kindle In the USA"
Bingo. One company gone, another has taken its place. There’s no stupidity in the story. The managers in both companies did exactly what business school professors and the best management consultants would tell them to do—improve profitability by focuson on those activities that are profitable and by getting out of activities that are less profitable." "Decades of outsourcing manufacturing have left US industry without the means to invent the next generation of high-tech products that are key to rebuilding its economy..."
Making sure labor is expensive should be easy -- encourage stronger unions, raise the minimum wage, put tariffs on trade with low wage countries. Virtually the entire economic community is against policies inteded to raise wages, but our strongest economic growth happened in the postwar boom, precisely the time period during which we were most eager to push policies that raise wages, so I'm not so convinced such things are all that harmful. And they give businesses powerful incentives to innovate. As for whether tariffs would cause more businesses to move to China, I doubt this as the demand comes mostly from this side of the Pacific even now and every dollar raised through such tariffs is a dollar we don't have to raise through other taxes. "invented the theory of endogenous growth" is an overstatement; "revived" and/or "extended" is more accurate. Have a look, e.g., at Phelps' work from the mid-60s. That Nobel was *long* overdue! It's not obvious though what we are giving up by outsourcing unskilled labor instead of building unskilled robots. I'm not convinced its a technology drain. This stuff is being outsourced precisely because its low value added stuff. It's not like a robot that screws together ipads would be super cutting edge. Similarly, I'm not sure what the robot/chinese trade off matters for labor. A ipad screwing robot is a substitute for American labor in the same way a chinese person is. Sorry, if it's not clear that is in response to your idea that this may be a policy matter.
" A final point: Cowen builds his case off two quarters of productivity decline. This may be due to labour hoarding in a de facto recession." Good point. Also, given the massive financial crash, I'm willing to be that companies in general were unable to invest in higher productivity, and saw little need, since their business had declined. And many (far more than usual) would be running ragged on the edge of bankruptcy. I agree with Andrew Bossie. Also consider that the iPad (or the Kindle, or Motorola's Android phones) in and of itself is a cutting edge innovation that has been entirely designed in the US. If it's outsourceasable then there is no point in not doing it. The post is an interesting idea, although I question whether the transition would be that problematic. It's not like you're going to wake up one morning and find out that all the cheap labor is suddenly gone. You'll see years of steadily increasing labor prices. "And as you go forth today remember always your duty is clear: To build and maintain those robots"
This seems muddled. Cheap Chinese workers are less productive than US workers, but they are (often) even cheaper than they are less productive, so unit costs go down even though labor productivity goes down as well. Getting cheaper labor is not the same thing as improving productivity. Andrew Bossie disdains the iPod-assembling robot because it's not 'super cutting edge'. Apparently it's not so trivial that the Swedes, Germans and Swiss aren't interested in the market (check the first link chris guan provided) - these are not low-wage countries. Actually some very 'low-skill' jobs are extremely challenging to automate. I worked on several mail-sorting automation projects in my career. Only the posts, with millions of mailpieces to sort, can afford to automate; even corporations with thousands of mailpieces arriving daily hire mail clerks. This is the dynamic we're missing out on - productivity-improvement technology is often more advanced than the products it is applied to, creating demand for engineers, scientists, technicians, and factory labor, as well as consultants, technical educators, and all the other disciplines any business needs. "The post is an interesting idea, although I question whether the transition would be that problematic. It's not like you're going to wake up one morning and find out that all the cheap labor is suddenly gone. " Good point, particularly as we know that foreign exchange rates never change quickly. It takes years of predictable increases in the forex rates, which will give U.S. manufacturers plenty of time to create a skilled workforce, social networks, economies of scale, etc. A lot of 70-80s Soviet military hardware was semi-automatic and/or had deep manual overrides. Why? As our colonel instructors said, "conscripts are cheaper than machinery, and easier to program too". I think the same premise might hold when comparing the industrialized American North and agricultural South before the Civil War. @windyanabasis "Good point, particularly as we know that foreign exchange rates never change quickly." Your joking right? Where in the world did you get this? Is it based on mainly on post-WW2 data? You can not assume an era dominated by Bretton Woods will have a dynamic similar to one dominated by electronic forex markets. Foreign exchange is now much more a market than it has ever been and markets are discontinuous systems, subject to long periods of stability punctured by server disequilibrium. There is no guarantee that we would get years of notice. Manufacturing is more complicated than people think. You can not just go out, hire a bunch of people, build a factory and start building products. It takes years to ramp up the production. Every factory is a deep network of people, some with little training, some with years of experience and some with decades of training and experience. It takes time to build that up. That is why, in the above comment Asesus started just with components and then motherboards and then full computers. They started building computers as soon as they could. It just took years to get there. Wait until you see the visualization of this in Ron Fricke's sequel to BARAKA, SAMSARA - it's like MANUFACTURED LANDSCAPES squared! There is obviously a lot to know about this. I think you made some good points in Features also.I did a search on the topic and found most people will agree with your blog. After China's cheap labor is gone, there's Africa. 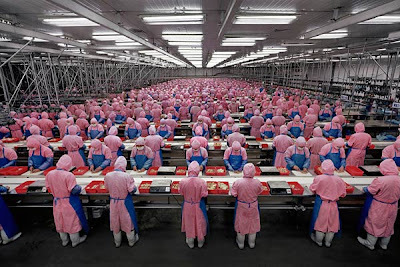 China uses its cheap labour to design and mass produce manufacturing robots which it exports! THis never works, Pat Buchnan been wanting it for years and even countries iwth high tariffs are replacing with autmation. Germany 1975 40 percent employed in manufacturing down to 17 percent today. The everyone has to work in a factory is dated, we need to find new jobs or make some service work pay better or update people to be more skilled in manufacturing, machinsts are getting more jobs than simple assemblers.